The March 2016 State of Oregon Economic Indexes of was released today. Full report is available here. We thank KeyBank for their generous support of this project. The Oregon measure of economic activity was down from an upwardly revised February number, while the three-month moving average, which smooths month-to-month volatility in the measure, rose to 0.95, where “zero” indicates average growth over the 1990-present period. Similar to February, the manufacturing sector contributed negatively. Firms heavily exposed to a stronger dollar or the energy sector continue to struggle. The construction sector also weighed on the measure, although building permits contributed positively during the month. Still, single-family housing remains soft relative to past expansions. Both the household and construction sectors contributed positively to the measure. Employment components in particular remain solid. Both consumer confidence and equity prices also remain supportive. 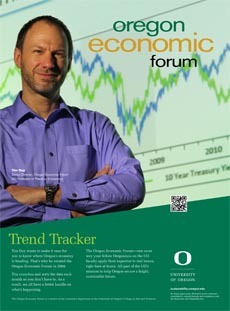 The University of Oregon Index of Economic Indicators was flat for the month. The UO Index has been largely flat since last October; such periods of fairly little change often occur during more mature economic expansions. Residential building permits rose to their highest level since 2007 as the sector continues its slow but steady improvement. Remaining indicators were again mostly flat. The interest rate spread widened in response to firmer financial conditions and reduced risk of recession.